The Fischer-Guidalevitch family collection contains 29 digitised images showing Eleonora Guidalevitch with family members at the beach in France, pictures of Eleonora Guidalevitch and her future husband Willy Fischer in the park, a wedding photo of Eleonora Guidalevitch and Willy Fischer, and pictures of Philippe André Fischer as a baby and as a todler. The Kopelman family originally resided in Russia. Marie Kopelman-Hancess had spent time in Belgium before 1940 and she was able to flee from Paris to Switzerland with her husband and daughter in 1941, where they lived out the rest of the war. Marie Kopelman-Hancess passed away in 1999. Marie's aunt, the widowed Perla Kopelman-Guidalevitch, had migrated from Sebastopol, Russia, to Belgium in 1920 together with her children Alexandre and Eleonora. Here, Eleonora married the Belgian-Jewish clerk Willy Fischer. In 1938, their son Philippe André Fischer was born. The complete Guidalevitch family - grandmother Perla Kopelman-Guidalevitch, her son Alexandre Guidalevitch, her daughter Eleonora Guidalevitch-Fischer, her son-in-law Willy Fischer and her grandson Philippe André Fischer - were arrested by the Sicherheitspolizei-Sicherheitsdienst (Sipo-SD) on 16 August 1943 and were taken to the Dossin barracks the following day, where their names were added to the deportation list of transports XXII A (Alexandre Guidalevitch), with foreigners, and XXII B (Eleonora Guidalevitch-Fischer and her family), with Belgian Jews. 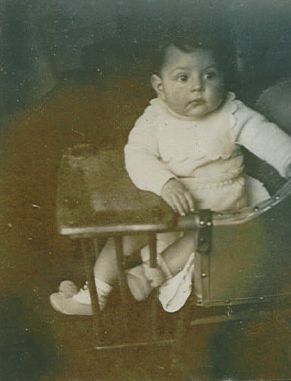 Since Perla Kopelman-Guidalevitch was older than 60, she was transferred to an elderly home (Altersheim) of the Jewish Council, hospice de Scheut in Anderlecht, Brussels, on 16 September 1943. She lived there until the end of the war and would become the sole survivor of the family in Belgium. Alexandre Guidalevitch, Eleonora Guidalevitch-Fischer, Willy Fischer and Philippe André Fischer were deported via Transport XXII on 20 September 1943. All of them were murdered. When Marie Kopelman-Hancess fled to Switzerland in 1941, she took the Kopelman family photo albums with her. After her death in 1999, the albums were passed on to her daughter Hélène and later on to Marie's grandson Philip Hesske. Mister Hesske very kindly provided Kazerne Dossin with scans of the pictures from the Kopelman family albums of the Guidalevitch family members.